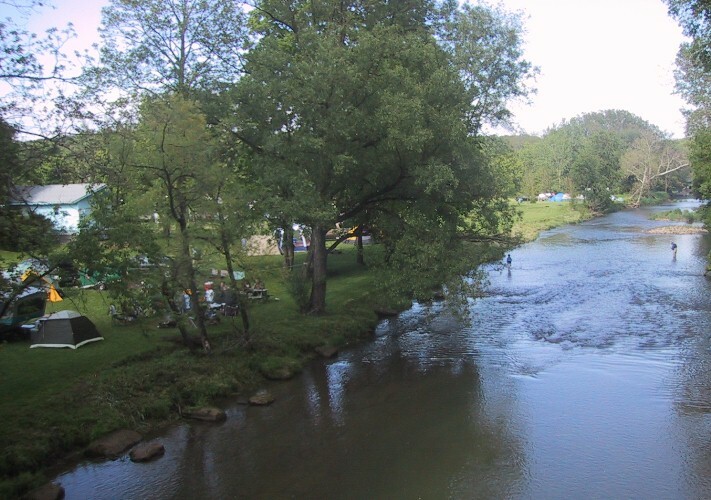 On the Clear Fork River, nestled in the foothills of the Appalachian mountains, River Trail Crossing is a quaint, privately owned campground. We invite you to visit River Trail Crossing - conveniently located only minutes from I-71 and Mohican State Park in Richland County, Ohio. Our campground is modern, offering full hook-up (water/electric/sewer) sites to primitive tent sites. We have pull through sites with 50 amp service for your BIG RIGS. All of our sites are level and spacious. Our restrooms, with hot showers and flush toilets, are kept immaculately clean and our camp store is well stocked! Fish - Come and try your luck fishing in the Clear Fork River where you'll find brown trout, as well as 26 other species of fish. Biking & Hiking on the 18 mile B & O paved bike trail! A playground, complete with sandbx for the little ones. Gold Prospectors Association of America (GPAA) is right upriver. Buy a gold pan in our campstore and try your luck. Or - just SOCIALIZE with some of the friendliest people ever! !